The Interior Department is moving forward with buyouts and early outs despite pushback from lawmakers in both parties on the Trump administration’s proposed massive cuts to the agency’s budget. Interior will rely on attrition, reassignments and separation incentives to reduce the size of its workforce, Secretary Ryan Zinke told a panel of the Senate Appropriations Committee Wednesday. Zinke noted the cuts may not go forward as requested but the department is planning to begin slashing its rolls regardless. Interior requested a 12 percent cut to its budget and a reduction of 4,100 employees. Government Executive first reported Interior’s workforce plans last month. Zinke emphasized throughout the hearing the budget proposal was not set in stone, repeatedly telling senators he would “work with” them on their pet issues. Sen. Tom Udall, D-N.M., the subcommittee’s ranking member, raised concern with Interior moving forward with workforce cuts without consulting Congress and before determining its fiscal 2018 spending level. “I’m troubled by a number of recent personnel decisions that call into question the department’s commitment to its workforce,” Udall said. The senator particularly noted a plan to reassign dozens of Senior Executive Service employees and to cut 1,000 jobs at the Bureau of Land Management. 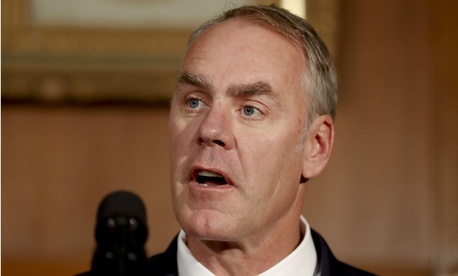 Zinke defended the reassignments, saying “SES, by definition, gets moved,” and adding that the supervisors had the choice of whether to relocate. The secretary hinted at the direction in which Interior would move when it implements its reorganization plan as required by a Trump executive order and subsequent Office of Management and Budget guidance, saying the department would shift resources away from its Washington, D.C., and Denver, Colo., offices. Its bureaus will “prioritize filling field positions rather than office positions” and limit hiring in D.C. and Denver. Despite the cuts to the workforce, Zinke pledged to improve morale at the department. The National Park Service ranked 262 out of 305 agency components across government, according to the latest rankings from the nonprofit Partnership for Public Service, which were based on responses to employee surveys. “It bothers me we’re not No. 1,” Zinke said. “I’m a competitive guy.” He cited micromanagement, lack of authority for front-line employees, and a history of sexual misconduct and harassment at NPS as contributing to the poor morale. Sen. Lamar Alexander, R-Tenn., took issue with that assessment, saying, “This is not a balanced budget.” He added the cuts should not be made “on the back of” the National Park Service and other important priorities.